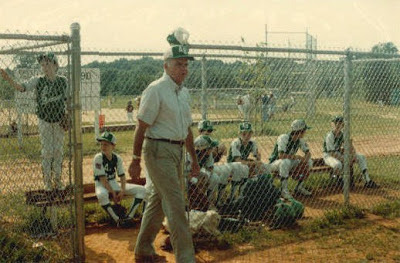 Myers Park Trinity Little League is blessed to call Randolph Park its home. The Marshall-Caudle Little League Complex is the result of a little luck and a lot of hard work. It began to take shape after three decades of play on borrowed land across Randolph Road. When Lloyd Caudle, Tom Marshall and other volunteers secured the use of the Mecklenburg County land that is now Randolph Park in the early 1980's, it was originally constructed with two Little League fields and a Babe Ruth field. The Little League fields had dirt infields, no mounds and no outfield fences. There were no bleachers - only a long concrete slab on each side of the backstop for fans to sit on. The dugouts had no roofs. There was a two-sided wooden scoreboard between the fields along a dirt walking path, which led to a small cinder-block concession stand (now "Billy's Building"). The fields were called Randolph East and West (later renamed to Kiser-Chapman) Fields, and they are still in use today. Home plate for the Babe Ruth field was located near the current right field fence of Wade Field. The left field fence of "the big field" is still there today, separating the Founders Field bullpen and our newest tee ball field. The curved foot print of the entire outfield fence remains today. When the E.C. Griffith company finally needed to develop its land on the west side of Randolph Road in the mid-1990's, Myers Park Trinity turned the Babe Ruth field into replacements for E.C. Griffith and Caudle Fields: Founders Field, dedicated to those who founded and developed our league, and Wade Field, in honor of long-time Harry & Bryant coach Jake Wade. Construction of tee ball fields, a concession stand and maintenance building, along with improvements to the Grier Heights Fields would follow. Our Junior League began using Independence Park near Memorial Stadium, which is now a great setting for Babe Ruth games. The next phase defines what our capital campaign is all about - the construction of a stadium at our newest Little League field at Randolph Park. "New Field" is already perhaps the finest youth field in Charlotte. You'll notice in the video below that we have plans for the seating and facilities to match. This is an exciting time in the life of Myers Park Trinity. Please give back and do your part for the team as we begin this exciting journey to build for the next generation.